Just take a look at some of the big movers to the upside in the under-$10 complex from Wednesday, including New Source Energy Partners (NSLP , which ripped higher by 66.6%; LookSmart (LOOK , which spiked higher by 31.7%; Dex Media (DXM , which jumped higher by 26.9%; and Alimera Sciences (ALIM - Get Report) , which soared by 26.7%. You don't even have to catch the entire move in lower-priced stocks such as these to make outsized returns when trading. 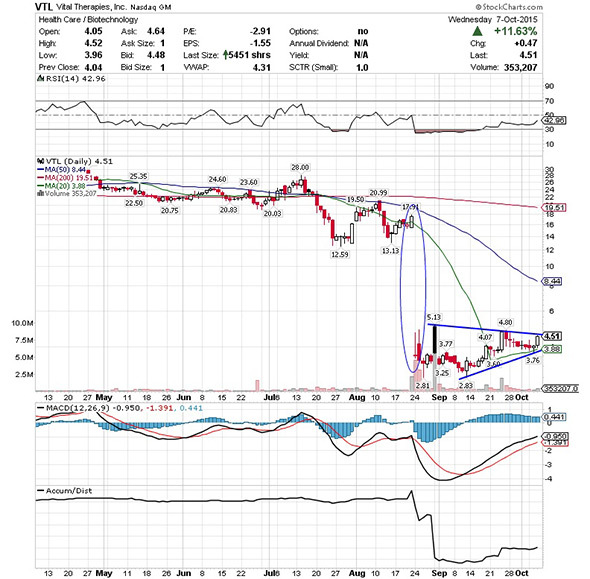 One under-$10 biotechnology player that's staring to trend within range of triggering major breakout trade is Vital Therapies (VTL , which focuses on developing a cell-based therapy for the treatment of acute liver failure in the U.S. This stock has been destroyed by the sellers over the last three months, with shares down huge by 81.1%. If you take a glance at the chart for Vital Therapies, you'll notice that this stock recently formed a double bottom chart pattern, after buyers stepped in at $3.60 to $3.76 a share over the last month. Shares of Vital Therapies spiked higher on Wednesday right off its 20-day moving average of $3.88 a share. That spike is quickly pushing this stock within range of triggering a major breakout trade above some key near-term overhead resistance levels. Market players should now look for long-biased trades in shares of Vital Therapies if it manages to break out above some key near-term overhead resistance levels at $4.80 to $5.13 a share with high volume. Look for a sustained move or close above those levels with volume that hits near or above its three-month average action of 669,025 shares. If that breakout develops soon, then this stock will set up to re-fill some of its previous gap-down-day zone from August that started around $18 a share. Traders can look to buy this stock off weakness to anticipate that breakout and simply use a stop that sits right around those recent double bottom support levels. One can also buy shares of Vital Therapies off strength once it starts to take out those breakout levels with volume and then simply use a stop that sits a comfortable percentage from your entry point. Another under-$10 educational and training services player that's starting to trend within range of triggering a big breakout trade is ITT Educational Services (ESI , which provides postsecondary degree programs in the U.S. This stock has been smashed by the sellers over the last six months, with shares off sharply by 43.2%. If you take a look at the chart for ITT Educational Services, you'll notice that this stock ripped sharply higher on Wednesday right off both its 50-day moving average of $3.43 a share and its 20-day moving average of $3.49 a share with decent upside volume flows. That solid spike to the upside is now quickly pushing shares of ITT Educational Services within range of triggering a big breakout trade above a key downtrend line that dates back to August. 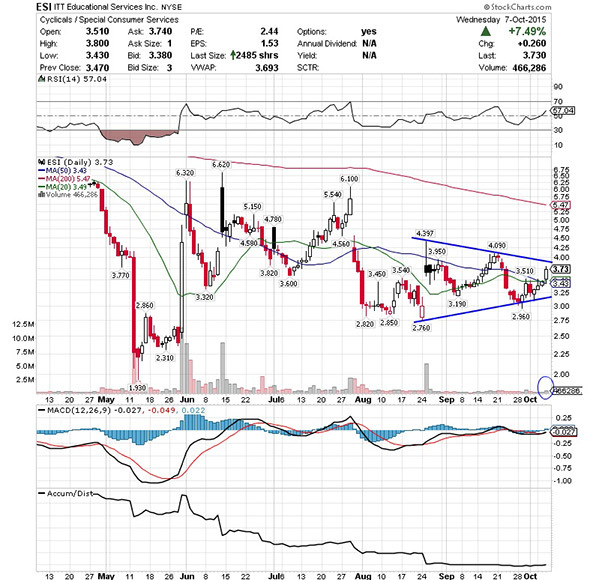 Market players should now look for long-biased trades in ITT Educational Services if it manages to break out above that downtrend line that triggers over $4 to $4.09 a share and then above $4.50 a share with high volume. Look for a sustained move or close above those levels with volume that hits near or above its three-month average action of 623,932 shares. If that breakout gets set off soon, then this stock will set up to re-fill some of its previous gap-down-day zone from July that started near $6 a share. Traders can look to buy this stock off weakness to anticipate that breakout and simply use a stop that sits right below its 50-day moving average of $3.43, or right around some more near-term support at $3.25 a share. One can also buy shares of ITT Educational Services off strength once it starts to clear those breakout levels with volume and then simply use a stop that sits a comfortable percentage from your entry point. One under-$10 business services player that's starting to spike within range of triggering a big breakout trade is Higher One (ONE , which provides technology-based refund disbursement, payment processing and data analytics services to higher education institutions and their students in the U.S. This stock has been hit hard by the sellers over the last three months, with shares down sharply by 28%. If you take a glance at the chart for Higher One, you'll notice that this stock ripped sharply higher on Wednesday back above both its 20-day moving average of $2.04 and its 50-day moving average of $2.05 a share with strong upside volume flows. Volume on Wednesday registered over 579,000 shares, which is well above its three-month average action of 134,269 shares. 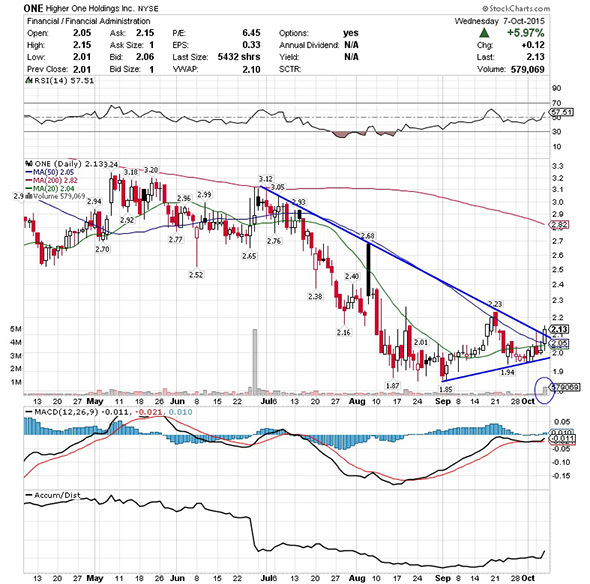 This high-volume move is now quickly pushing this stock within range of triggering a big breakout trade above a key downtrend line that dates back to June. Traders should now look for long-biased trades in Higher One if it manages to break out above some near-term overhead resistance levels at $2.20 to $2.23 a share with high volume. Look for a sustained move or close above those levels with volume that hits near or above its three-month average action of 134,269 shares. If that breakout kicks off soon, then this stock will set up to re-test or possibly take out its next major overhead resistance levels at $2.40 to $2.68, or even its 200-day moving average of $2.82 to around $3 a share. Traders can look to buy this stock off weakness to anticipate that breakout and simply use a stop that sits right around some key near-term support levels at $2 to $1.94 a share. One can also buy shares of Higher One off strength once it starts to bust above those breakout levels with volume and then simply use a stop that sits a comfortable percentage from your entry point. Another under-$10 biotechnology player that's starting to trend within range of triggering a near-term breakout trade is InVivo Therapeutics (NVIV , which focuses on developing and commercializing technologies for the treatment of spinal cord injury. This stock has been smacked down by the sellers over the last three months, with shares off by 47.7%. If you look at the chart for InVivo Therapeutics, you'll notice that this stock has been downtrending badly over the last three months and change, with shares plunging sharply lower off its high of $17.87 to its recent low of $7.33 a share. During that downtrend, shares of InVivo Therapeutics have been consistently making lower highs and lower lows, which is bearish technical price action. That said, this stock has now started to bounce off some near-term support at $7.84 and it's quickly moving within range of triggering a near-term breakout trade above some key overhead resistance levels. Market players should now look for long-biased trades in InVivo Therapeutics if it manages to break out above some near-term overhead resistance levels at $8.70 to around $9 a share with high volume. Look for a sustained move or close above those levels with volume that registers near or above its three-month average action of 309,783 shares. 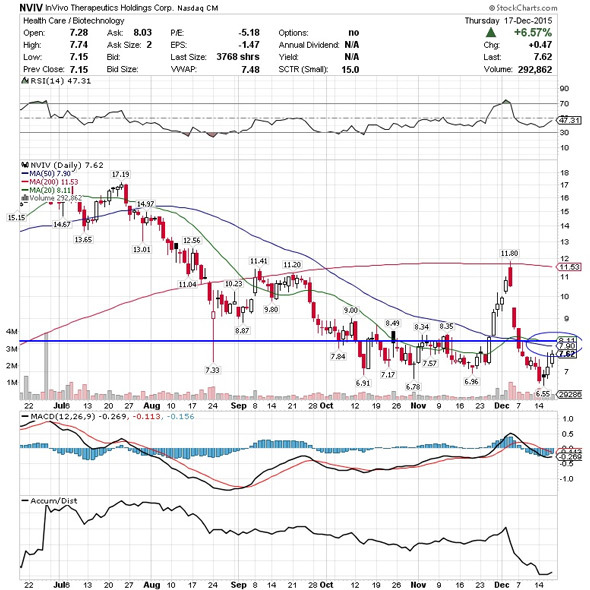 If that breakout materializes soon, then this stock will set up to re-test or possibly take out its next major overhead resistance levels at its 20-day moving average of $9.80 to its 50-day moving average of $10.84, or even $11.20 to $11.50 a share. Traders can look to buy InVivo Therapeutics off weakness to anticipate that breakout and simply use a stop that sits right around some key near-term support levels at $7.84 to $7.33 a share. One can also buy this stock off strength once it starts to trend above those breakout levels with volume and then simply use a stop that sits a comfortable percentage from your entry point. One final under-$10 semiconductor player that's starting to move within range of triggering a big breakout trade is NeoPhotonics (NPTN - Get Report) , which designs and manufactures hybrid photonic integrated optoelectronic modules and subsystems for bandwidth-intensive, high-speed communications networks. This stock has been under some selling pressure over the last three months, with shares down notably by 17%. If you take a glance at the chart for NeoPhotonics, you'll notice that this stock has been consolidating and trending sideways over the last two months and change, with shares moving between $5.61 on the downside and $7.74 on the upside. Shares of NeoPhotonics have now started to trend higher right off its 20-day moving average of $6.93 and back above its 50-day moving average of $7.23 a share. 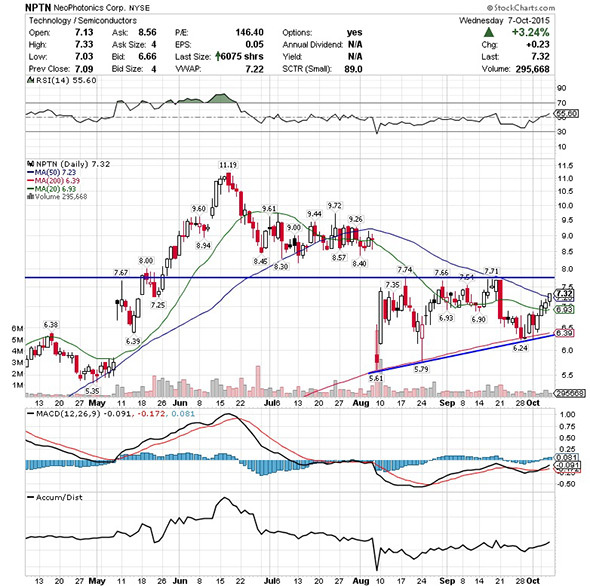 That move is now quickly pushing this stock within range of triggering a big breakout trade above the upper-end of its recent sideways trending chart pattern. Traders should now look for long-biased trades in NeoPhotonics if it manages to break out above some near-term overhead resistance levels at $7.71 to $7.74 a share with high volume. Look for a sustained move or close above those levels with volume that hits near or above its three-month average action of 672,580 shares. If that breakout develops soon, then this stock will set up to re-fill its previous gap-down-day zone from August that started just above $9 a share. Traders can look to buy shares of NeoPhotonics off weakness to anticipate that breakout and simply use a stop that sits just below its 20-day moving average of $6.93 or near its 200-day moving average of $6.39 a share. One can also buy this stock off strength once it starts to spike above those breakout levels with volume and then simply use a stop that sits a comfortable percentage from your entry point.